Sponsored by Division 15 of APA, the second edition of this groundbreaking book has been expanded to 41 chapters that provide unparalleled coverage of this far-ranging field. Internationally recognized scholars contribute up-to-date reviews and critical syntheses of the following areas: foundations and the future of educational psychology, learners’ development, individual differences, cognition, motivation, content area teaching, socio-cultural perspectives on teaching and learning, teachers and teaching, instructional design, teacher assessment, and modern perspectives on research methodologies, data, and data analysis. New chapters cover topics such as adult development, self-regulation, changes in knowledge and beliefs, and writing. Expanded treatment has been given to cognition, motivation, and new methodologies for gathering and analyzing data. 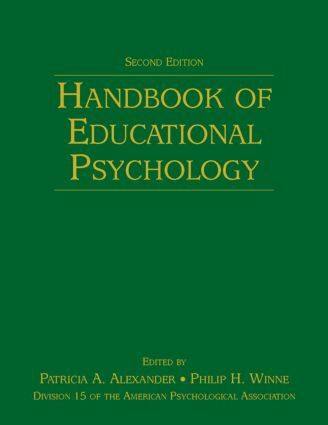 The Handbook of Educational Psychology, Second Edition provides an indispensable reference volume for scholars, teacher educators, in-service practitioners, policy makers and the academic libraries serving these audiences. It is also appropriate for graduate level courses devoted to the study of educational psychology. Adult Development, Schooling, and the Transition to Work: M Cecil Smith, Thomas G. Reio, Jr.